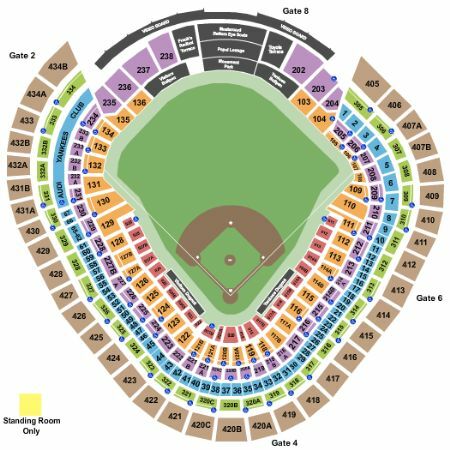 New York Yankees vs. Los Angeles Angels of Anaheim Tickets - 9/17/2019 - Yankee Stadium in Bronx at Stub.com! For E-Ticket and Electronic Transfer Delivery Methods Only: These are Mobile Entry Tickets. Must have smart device on hand to enter event. Do not print these tickets. Mobile Entry Tickets. Must have smart device on hand to enter event. Tickets will be ready for delivery by Sep 13, 2019. Mobile Entry Tickets. Must have smart device on hand to enter event. Do not print these tickets. Tickets will be ready for delivery by Sep 16, 2019. Includes access to Audi Yankees Club & Pepsi Lounge. Mobile Entry Tickets. Must have smart device on hand to enter event. Do not print these tickets. Tickets will be ready for delivery by Sep 15, 2019. XFER Mobile Entry. Scan your tickets from your mobile phone for this event. Tickets will be ready for delivery by Sep 16, 2019. Second row in this section. Tickets will be ready for delivery by Sep 16, 2019. Mobile Entry Tickets. Must have smart device on hand to enter event. Do not print these tickets. Tickets will be ready for delivery by Sep 15, 2019. Mobile Entry Tickets. Must have smart device on hand to enter event. Do not print these tickets. Audi Yankees Club access. Features a cocktail bar and a dining lounge with high-definition televisions. Aisle seats. Mobile Entry Tickets. Must have smart device on hand to enter event. Do not print these tickets. Tickets will be ready for delivery by Aug 28, 2019. Mobile Entry Tickets. Must have smart device on hand to enter event. Tickets will be ready for delivery by Sep 10, 2019. These seats are on the aisle with purchase of the entire group. Tickets will be ready for delivery by Sep 15, 2019. Mobile Entry Tickets. Must have smart device on hand to enter event. Do not print these tickets. Audi Yankees Club access. Features a cocktail bar and a dining lounge with high-definition televisions. Mobile Entry Tickets. Must have smart device on hand to enter event. Do not print these tickets. Tickets will be ready for delivery by Sep 12, 2019. Tickets will be ready for delivery by Sep 13, 2019. Access to Audi Club. Pepsi Lounge. Does not include admission to event. Tickets will be ready for delivery by Sep 13, 2019. Mobile Entry Tickets. Must have smart device on hand to enter event. Do not print these tickets. Tickets will be ready for delivery by Sep 13, 2019. ADA accessible these tickets allow for wheelchair access if needed. Chairs are provided for non-wheelchair customers. Tickets will be ready for delivery by Sep 13, 2019. Mobile Entry Tickets. Must have smart device on hand to enter event. Do not print these tickets. Tickets will be ready for delivery by Sep 17, 2019. Includes access to Audi Yankees Club & Pepsi Lounge. Tickets will be ready for delivery by Sep 13, 2019. ADA accessible these tickets allow for wheelchair access. Tickets will be ready for delivery by Sep 14, 2019. ADA accessible these tickets allow for wheelchair access. Tickets will be ready for delivery by May 03, 2019. ADA accessible these tickets allow for wheelchair access. Mobile Entry Tickets. Must have smart device on hand to enter event. Do not print these tickets. Tickets will be ready for delivery by Sep 16, 2019. Tickets will be ready for delivery by Sep 16, 2019. Third row in this section. Tickets will be ready for delivery by Sep 15, 2019. Does not include admission to event. Tickets will be ready for delivery by Sep 16, 2019. Aisle seats if entire quantity is purchased. Aisle Seats. These seats are on the aisle with purchase of the entire group. Tickets will be ready for delivery by Sep 14, 2019. Mobile Entry Tickets. Must have smart device on hand to enter event. Do not print these tickets. Aisle seats. Tickets will be ready for delivery by Sep 17, 2019. Tickets will be ready for delivery by Aug 25, 2019. Mobile Entry Tickets. Must have smart device on hand to enter event. Do not print these tickets. Access to Jim Beam Suite Club. Tickets will be ready for delivery by Sep 16, 2019. Tickets will be ready for delivery by Sep 17, 2019. First row in this section. Tickets will be ready for delivery by Sep 15, 2019. Does not inclued admission into the event.Parking Pass only within 1 mile way. Aisle Seats. Tickets will be ready for delivery by Aug 25, 2019. Mobile Entry Tickets. Must have smart device on hand to enter event. Do not print these tickets. Aisle seats. Tickets will be ready for delivery by Sep 15, 2019. Mobile Entry Tickets. Must have smart device on hand to enter event. Do not print these tickets. Includes access to MVP Club Lounge. Tickets will be ready for delivery by Sep 16, 2019. Yankees Pregame Experience Package includes a game ticket Field sections 115 thru 125 (orders of 3 or more may be split) | Pregame guided tour featuring the New York Yankees Museum and private access to Monument Park before it opens to the public followed by exclusive access to view batting practice (weather permitting) | $25 food/beverage credit included with each ticket | Collectible New York Yankees memorabilia item (1 per person) | Ticket upgrades available upon request |. Standard Hotel Package includes Two nights at a 4-Star New York City property (check-in day before game, check-out day after game) | Game ticket in Jim Beam Suite sections 317 thru 321 featuring access to the Jim Beam Suite Lounge and Sony Terrace including complimentary snacks and soft drinks, private cash bar, cushioned seats and private entrance and restrooms (orders of three or more may be split) | $25 food/beverage credit included with each ticket | MLB merchandise of your choosing valued at $50 per person redeemable online only | Ticket upgrades - additional hotel nights or specific days may be obtainable upon request | Rate is based on double occupancy | Orders for a quantity of one are subject to an additional charge |. Yankee Stadium Legends Suite includes chef-prepared food beverages waitress service sofas and table seating and complete club access. Alcoholic beverages available for purchase. Deluxe Hotel Package includes Two nights at a 4-Star New York City property (check-in day before game, check-out day after game) | Roundtrip airport transfers | Game ticket in Field sections 115 thru 125 (orders of three or more may be split) | $25 food/beverage credit included with each ticket | MLB merchandise of your choosing valued at $50 per person redeemable online only | Ticket upgrades - additional hotel nights or specific days may be obtainable upon request | Rate is based on double occupancy | Orders for a quantity of one are subject to an additional charge |.